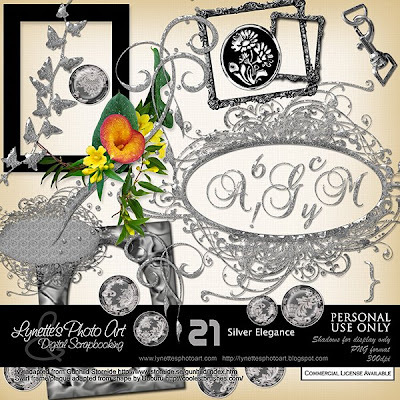 Silver Elegance is a sparkling collection of 21 highly detailed elements including an exquisite alpha with matching numbers and punctuation, glass encased lace buttons, a gorgeous lacy frame and an awesome floral cluster. 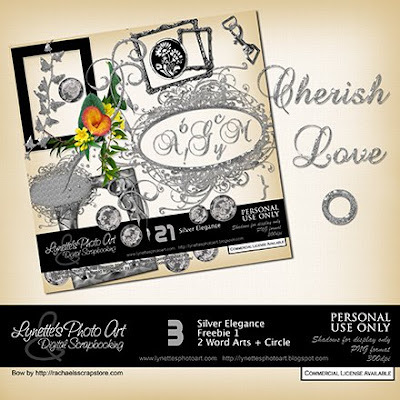 Your freebie has two word arts and a circle. Only $2.99 at my PayPal store. Click the "Buy It Now" button beneath the preview to purchase it. Credits: Ivy adapted from Gunhild Storeide http://www.storeide.se/gunhild/index.htm; swirl brush by Buburu http://coolestbrushes.com/.